patient should be sufficiently undressed but draped to preserve modesty. compare left to right and proximal to distal. observe for asymmetry, atrophy or hypertrophy. observe for abnormal involuntary movements. Some textbooks and neurologists include co-ordination as a separate category of the neurological exam whereas here it is included as part of the motor exam. To perform tasks of co-ordination one requires normal motor, sensory, and cerebellar systems. Lesions affecting any of these areas could give rise to abnormal tests of co-ordination. rapid index to thumb movements or individual digits to thumb, rapid small index finger circles over the opposite dorsal webspace, rapidly alternate each hand palmar then dorsal aspect down over thigh or opposite hand. ask the patient to place their heel on their opposite knee and slide their heel down their shin to the ankle. ask to the patient to tap their opposite knee with their heel. have the patient reach for your finger with their large toe. ask the patient to perform rapid foot taps. P.A. Stewart, Ph.D. Professor, Division of Anatomy, Department of Surgery, University of Toronto, for advice on the pedagogical aspects of the program, J. Raymond Buncic, MD, Ophthalmologist-in-chief, Hospital for Sick Children, Toronto, Ontario Canada for providing the fundus image, and Meaghan Brierley for creating the “visual fields” animation sequences and the dermatome illustration. Generous support for the development of this program was provided by the Faculty of Medicine, University of Toronto. Alexander died at the age of 13, from complications arising from a brain arteriovenous malformation. He was a kind and gentle child who inspired others to try new things. He is sadly missed. use either calipers or a opened paper clip with two parallel ends. demonstrate to the patient with eyes open by applying either one or two points of the stimulus to the fingerpad. ask the patient to close their eyes. deliver the stimulus and ask the patient to report whether they feel one or two points. normal values over the fingerpads are 2-4 mm. explain to the patient that you will be drawing a number in the palm of their hand. explain to the patient what is up and down, the distal side is usually up as this is a typical orientation of the palm. with a blunt item such as your fingertip draw a number across the palm and ask the patient to identify it. explain to the patient that you will be placing an item in their hand which they should then manipulate and identify with their eyes closed. stimuli include different coins, a key, a safety pin, a paper clip, a coin, etc. with eyes open demonstrate to the patient that you will touch them on the left side, the right side or both. this should only be done if the patient can perceive a unilateral stimulus (i.e. if there is loss of pain and temperature or light touch on one side, there would be no point assessing extinction). have the patient close their eyes and as you deliver a gentle touch, report whether they feel it on the left side, right side or both sides. wiggle a finger in the left, right or both visual fields and ask the patient to report where they see it. snap your fingers on the left, right or both sides and have the patient report where they hear the stimulus. when testing for extinction, it is important to deliver bilateral stimuli simultaneously with no time lag in between. The major role of the facial nerve is to innervate the muscles of facial expression. These can be observed while taking the history and then more formally assessed during the neurological examination. 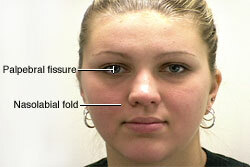 observe for asymmetry – widening of the palpebral fissure or flattening of the nasolabial fold. observe for involuntary facial movements (e.g. hemifacial spasm, orofacial dyskinesia, myokymia, or synkinesis). ask the patient to wrinkle their forehead by raising their eyebrows and close their eyes tightly. Observe for asymmetry of ability to burry the eyelashes and palpate for differences of ability to resist eye opening. Ask the patient to show their teeth, puff out their cheeks and appose their lips. recall that the efferent limb of the corneal reflex (see trigeminal nerve) is through the 7th cranial nerve. although patients may have an asymmetric face, there should be no facial weakness. lower motor neuron weakness causes weakness of the entire side of the face with equal involvement of upper and lower facial muscles. an upper motor neuron lesion of the contralateral supranuclear pathway results in weakness primarily of lower muscles of facial expression. The upper muscles of facial expression (frontalis and orbicularis oculi) are much less affected because the facial nucleus that innervates them receives partial input from the ipsilateral hemisphere. Although taste is not typically assessed during a routine neurological examination, the 7th nerve does supply taste to the anterior two-thirds of the tongue and hard and soft palates. This can be tested using salty, bitter, sour or sweet solutions. the tongue is protruded and held gently by the examiner. a small sample of solution is applied to one side of the anterior two-thirds of the tongue using a cotton tipped applicator saturated with the solution. with the tongue still protruded, the patient should be asked to point to a sign displaying one of the four possible tastes. the patient is then given a small sip of water and the test is repeated using an alternate stimulus. the reason the tongue is maintained protruded is because if the patient were allowed to put their tongue back in their mouth in order to verbalize their response, they could masticate and transfer the stimulus to the opposite side which could be affected if there was a lesion of the 7th nerve.